The cafe industry in China is booming; according to consultancy Euromonitor, the cafe market is valued at over an estimated 12 billon yuan! Over the past few years, China’s capital saw the opening of many exciting third-wave coffee specialty establishments. These up-and-coming cafes are the brainchild of many ambitious entrepreneurs from all walks of life. From the hidden boutique cafe Fnji (only accessible when you walk through its furniture retail section) to the impressively designed Maan Coffee which bears a striking resemblance to Hogwarts, we are excited to share with you 10 Instagram-Worthy Cafes in Beijing that we have visited recently. Each cafe inherently exudes a very different vibe – read on more to find out! Analog Coffee is an industrial-chic specialty coffee shop located in one of the various alleyways diverging away from the main street Nan Luo Gu Xiang. Start your day with an espresso (RMB25) or cafe latte (RMB35). Their limited snack menu features brownies (RMB35 each) and salami subs (RMB35 each) too. Barista Coffee Roasters is an intimate cafe that instantly reminded us of the ones you would come across in Melbourne. Indeed, we were unsurprised when we found out that the only available books on the tiny shelf were actually exhaustive guidebooks featuring specialty coffee shops in Australia. Barista Coffee Roasters – as its name suggests – only serves coffee and a limited selection of bite-size snacks, but it is where everyone who’s serious about coffee gather. The space is extremely narrow and is actually more of a coffee bar as there is literally nowhere else to sit besides the few bar stools. From Rwanda to Kenya, the beans used here are sourced from all over the world. Order a flat white (RMB38) or a cappuccino (RMB28) and watch the experienced barista work his magic right in front of you. Each aromatic brew is served with a wrapped crunchy caramel biscuit. Flat White Cafe has been unanimously coined as Beijing’s best coffee shop and we have to agree with that – what stole our hearts was indeed the coffee brewed from Rickshaw Coffee Beans. The spacious room attached to 798′s Flat White Cafe is actually Rickshaw Coffee’s roastery and the roasts are delivered fresh weekly to the other outlets. We loved the signature Flat White Coffee (RMB28) and their newest creation of Rose Coffee (RMB38). Named after the popular Aussie-Kiwi hot beverage (the debate on its origin is still ongoing), Flat White Cafe’s menu is unsurprisingly largely inspired by the Australians and New Zealanders. Their brunch menu features scrumptious classics such as Eggs Benedict (RMB78), Ricotta Hotcakes (RMB48) and New Zealand Beef Burger (RMB68). Digital nomads will be thrilled to hear Flat White Cafe offers free and reliable wifi too. Hidden inside a beautiful and minimalistic-themed spacious furniture shop, the discovery of Fnji was akin to discovering a secret garden! Fnji Cafe is located right at the back of the retail section and resembled a quaint Japanese teahouse. Despite its concealed location, Fnji Cafe sees no lack of patrons. The cafe was a hit amongst the ladies with its delectable sugary treats. Abstract-looking chef’s signature specials would however require a one-day booking in advance. Maan Coffee looked nothing spectacular from the outside but one foot in and you would be blown away by the extravagance of the cafe’s set up. With warmly lit chandeliers and a towering gigantic bookshelf, it is not hard to wonder if you have ended up at Hogwarts. Ambience aside, the Korean-owned cafe chain is famous for their fluffy waffles and toasts. Whoever said that delicious food doesn’t taste good has yet to visit the stylish neighbourhood eatery Moka Bros. Designed by Venezuelan architect Coro Urdaneta, the award-winning health food bistro is a modern comfy lounge that believes in the simple philosophy of eating well and feeling good about it. Moka Bros takes pride in serving nutritious dishes that pack a punch with every bite. Each wholesome item is created from scratch and is free from both additives and preservatives. Dig into the fresh Shrimp Avocado Salad (RMB68) or treat yourselves to one of their refreshing smoothies (medium – RMB38, large – RMB45). Housed under the same roof as Peking International Youth Hostel, Peking Cafe is a stunning garden-themed cafe characterised by hues of green and white. The unpretentious homely cafe serves comforting Western dishes (breakfast items from 7.30am – 11am) such as the caesar salad and carbonara pasta, as well as a comprehensive beverage menu of coffees, teas and juices. The rooftop terrace upstairs allows you to view the bustling street of Nan Luo Gu Xiang from above. While it might be too warm to dine alfresco during summer, you can cool down with their affordable range of imported bottle beers under one of the shady umbrellas. The Rug Cafe has three outlets across Beijing and it specialises in hearty brunch food and other Western delights. It is a proud partner of various organic local partners and it is worth mentioning that only organic fair-trade coffee beans are used for their beverages. Their hollandaise sauce are also made fresh in-house with organic eggs every morning. The Rug’s gourmet pizzas have been shortlisted by The Beijinger Pizza Cup 2014 as top four. We particularly enjoyed the homemade Special Rome (RMB118) that boasts four flavours (pepperoni and garlic, bacon with hot chilli pepper, spinach plus egg and basil clams) in each corner of the pizza! It is recommended for sharing amongst 2 to 3 diners. Barely half a year old Voyage Coffee Shop might be a new kid on the street of Bei Luo Gu Xiang, but is certainly not a newbie (its original branch is in 798 art zone). Voyage Coffee Shop is an inviting space with lots of natural light streaming in, hence making it ideal for a daytime work station. Food is however not served here. A flat white easily sets you back by RMB33; well, why don’t you stay longer and tap on their wifi to maximise your money spent? Zarah is more than just a pretty cafe. The multipurpose space also functions as an art gallery, lounge and restaurant. 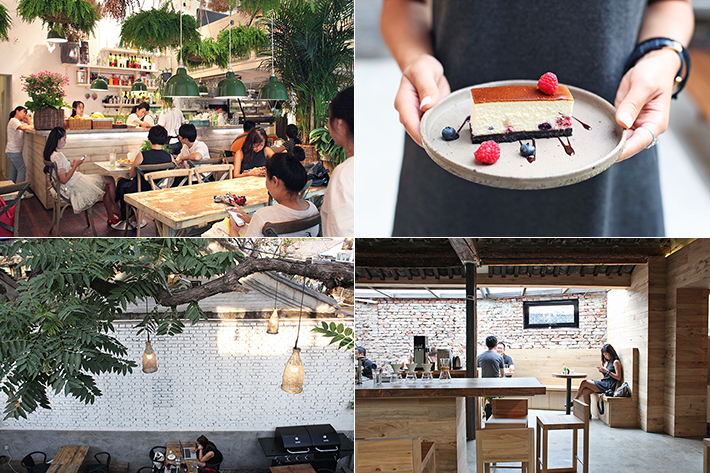 Housed in an old restored Beijing-style courtyard, the gorgeous two-storey cafe is not to be missed when in Beijing. From European-style breakfast items to Asian fusion dishes, Zarah’s all-encompassing menu will leave you spoilt for choice. The beverage list is equally extensive and one can choose from Aussie Flat White (RMB30) or even the traditional Vietnamese Coffee (RMB32). Hui Jun Ng is a staff writer for ladyironchef. She previously worked in the food and marketing industry. She loves traveling and enjoys exploring underrated destinations. In her free time, you will find her indulging in coffee and her all time favourite local dish – bak chor mee.